A new strategic partnership between The Ohio State University College of Engineering and Sinclair Community College will help prepare students for careers in the unmanned aircraft systems industry, which is expected to grow to $100 billion by 2025. The two institutions will develop pathways from existing Sinclair UAS certificate and future Unmanned Aerial Systems (UAS) associate degree programs into data analytics and geospatial precision agriculture programs. Ohio State students will also have the opportunity to take general education courses through Ohio State and, upon completing UAS technical courses at Sinclair, to earn a UAS certificate or degree through Sinclair. “Ohio State University is a global leader in technology and education and this partnership can provide Sinclair with the resources and human talent necessary to take our UAS program to the next level,” Sinclair President Steve Johnson said. Sinclair recently received $4 million in state funding to renovate and expand their physical location on the Dayton campus to support the mission of the National Center for UAS Training and Education. “Ohio State’s unmanned aircraft and data analytics expertise complements the strengths of Sinclair and the Dayton region in this important emerging industry,” said Ohio State College of Engineering Dean David B. Williams. “Our teaching, research and workforce development collaboration should serve as a model for our fellow institutions throughout the state. The convergence of unmanned aircraft and big data expertise is critical. Unmanned aircraft capture an immense amount of data and images that need processed, stored, calibrated, analyzed, evaluated and shared. That’s where Ohio State’s College of Engineering can play a key role." 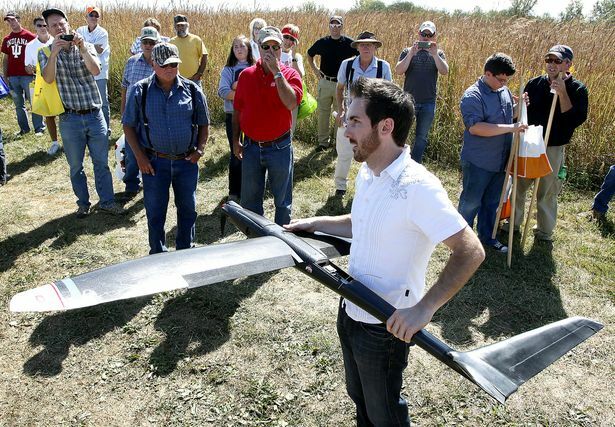 The two institutions will also seek to expand upon existing UAS resources in airspace and UAS vehicles and will seek a FAA Certificate of Authorization (COA) to fly over The Ohio State University Airport at Don Scott Field and the Molly Caren Agricultural Facility to provide new and innovative precision agriculture programming. Ohio State is a national leader in computer science and data analytics education. The College of Engineering and College of Arts and Sciences recently launched an interdisciplinary undergraduate major in data analytics—the first of its kind in the country offered by a major research institution—to address a growing need for data analytics professionals. Within the Sinclair partnership, additional data analysis curriculum and training focused on unmanned systems will be developed. Concurrently, research opportunities at the intersection of UAS and data analytics also will grow. One of the oldest and best known community colleges in the nation, Sinclair is a board member of the prestigious League for Innovation in the Community College. The college serves nearly 40,000 unduplicated students each year, making it the third largest community college in Ohio and one of the largest colleges of any kind in Southwest Ohio. Sinclair offers over 170 accredited degree and certificate programs and has awarded more degree and certificates than any other community college in the state of Ohio over the last five years. National leaders such as the Bill & Melinda Gates Foundation partner with Sinclair on critical projects such as the Completion by Design initiative which seeks to eliminate barriers to student completion.